A 150-year-old fossil feather mystery has been solved by an international research team including Dr. Michael Pittman from the Department of Earth Sciences, the University of Hong Kong. Dr. Pittman and his colleagues applied a novel imaging technique, laser-stimulated fluorescence (LSF), revealing the missing quill of the first fossil feather ever discovered, dethroning an icon in the process. This fossil feather was found in the Solnhofen area of southern Germany in 1861. The isolated feather was used to name the iconic fossil bird Archaeopteryx and was closely identified with its skeletons. Unlike the feather impressions preserved in some Archaeopteryx fossils, the isolated feather is preserved as a dark film. 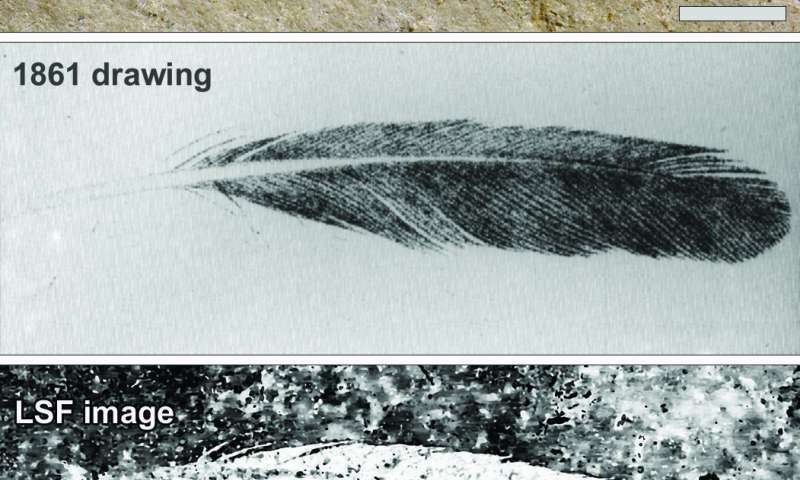 The detailed 1862 description of the feather mentions a rather long quill visible on the fossil, but this is unseen today. Even recent X-ray fluorescence and UV imaging studies did not end the debate of the "missing quill." The original existence of this quill has therefore been debated and it was unclear if the single feather represented a primary, secondary, or primary covert feather. The results of this study are described in the journal Scientific Reports, and underscore the potential and scientific importance of Laser-Stimulated Fluorescence, which is being developed by Thomas G Kaye of the Foundation for Scientific Advancement, USA and Dr. Pittman. "My imaging work with Tom Kaye demonstrates that important discoveries remain to be made even in the most iconic and well-studied fossils," says Dr. Pittman. With the help of the LSF images, the team finally solved the 150-year-old missing quill mystery. The now completely visible feather allowed detailed comparisons with the feather impressions of Archaeopteryx and with living birds. Before this LSF work, the feather was thought to represent a primary covert from Archaeopteryx, but this study shows that it differs from coverts of modern birds by lacking a distinct s-shaped centerline. The team also disconfirmed that the feather represented a primary, secondary, or tail feather of Archaeopteryx. Instead, the new data indicates that the isolated feather came from an unknown feathered dinosaur and that its attribution to Archaeopteryx was wrong. "It is amazing that this new technique allows us to resolve the 150-year-old mystery of the missing quill," says Daniela Schwarz, co-author in the study and curator for the fossil reptiles and bird collection of the Museum für Naturkunde, Berlin. This discovery also demonstrates that the diversity of feathered dinosaurs was likely higher around the ancient Solnhofen Archipelago than previously thought. "The success of the LSF technique here is sure to lead to more discoveries and applications in other fields. But, you'll have to wait and see what we find next!"' added Tom Kaye, the study's lead author.